you know us anyway Jill are paths have crossed many times, see you at Wallingford. Cool! No doubt I'll recognise you when I see you. If not I'll definitely recognise the dogs! Come and introduce yourselves at Woolacombe. I'm from Leics too! I'm on row 10. 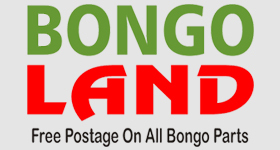 Look for the Bongo flag flying! See you there. Looking forward to seeing you all there. We no longer have our bongo, but had a great time at Woolacombe last year, so will be there in our Renault Master. Unfortunately I have had to cancel my booking to Woolacombe. Family matters getting in the way. Hope you all have a great time and this weather keeps up for you all. See you in another field somewhere, sometime. Was a really good meet and the venue was good. Within walking distance of the beach, and providing club house (if that's your thing) and swimming pool. Only downside is the very steep roads between the terraced pitches. Because we were a meet, a few steps between the terraces would have been nice, but I appreciate usually you don't visit other pitches! Thanks for organising this Jan. Look forward to next year.